No matter how engaging the actors or riveting the plot, sometimes, you’re distracted by something else in a film: a dramatic architectural setting that’s so dazzling, it’s practically a character in itself. We can’t help but drool over Jackie Treehorn’s Malibu Beach manse in ‘The Big Lebowski’ and covet Mia Wallace’s stylish living room in ‘Pulp Fiction’. 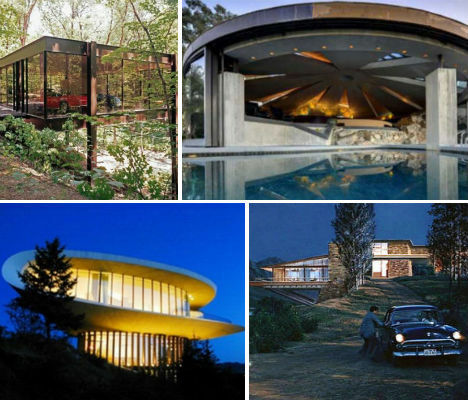 These 13 (mostly) real modern houses featured in major films are memorable even when the movies are not, despite – in some cases – only appearing for a moment or two. The memorable modern home in Highland, Illinois that held Cameron Frye’s father’s Ferrari in the 80’s classic ‘Ferris Bueller’s Day Off’ could be yours for just $1.65 million. After languishing on the market, the home is getting a modern makeover complete with high-end furniture and will be back up for sale in a month or two. The 4-bedroom, 4-bath house was designed in 1953 by A. James Speyer and David Haid and is officially known as the ‘Ben Rose House’. The main vampire family in the ‘Twilight’ series, the Cullens, don’t lurk in the dark recesses of a run-down Victorian like you might expect. In the film adaptation of the first book, ‘Twilight’, film producers took the liberty of placing Edward Cullen and Co. in a bright, modern home known as the ‘Hoke House’, owned by Nike executive John Hoke. For subsequent movies ‘New Moon’ and ‘Breaking Dawn’, the production moved on to yet another modern house in West Vancouver, this one designed by architect Arthur Erickson. That 5,100-square-foot stunner is on the market for $2,998,000. 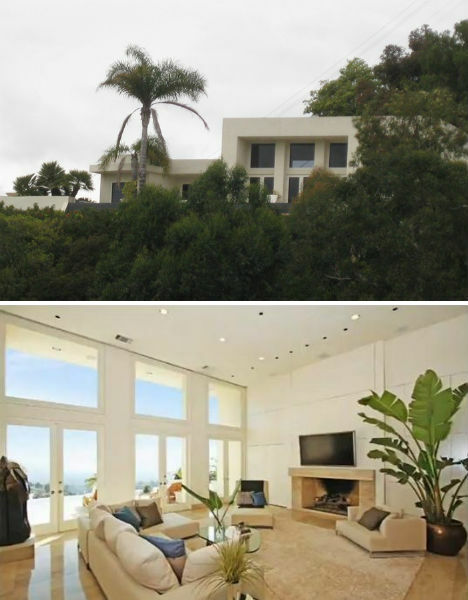 The modern Malibu party house occupied by pornographer Jackie Treehorn in the film ‘The Big Lebowski’ is actually located in Benedict Canyon. 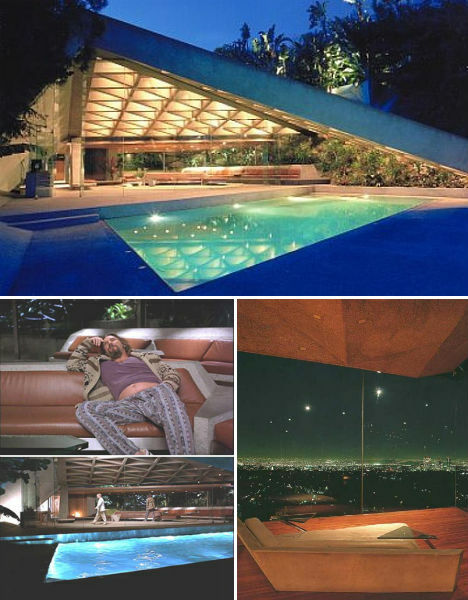 The Sheats/Goldstein residence was designed by architect John Lautner, whose distinctive homes are frequent film settings. An example of American Organic Architecture, the Sheats/Goldstein residence is built into the sandstone of the hillside and intended to mimic a cave. It also appeared in Charlie’s Angels: Full Throttle and Bandits. 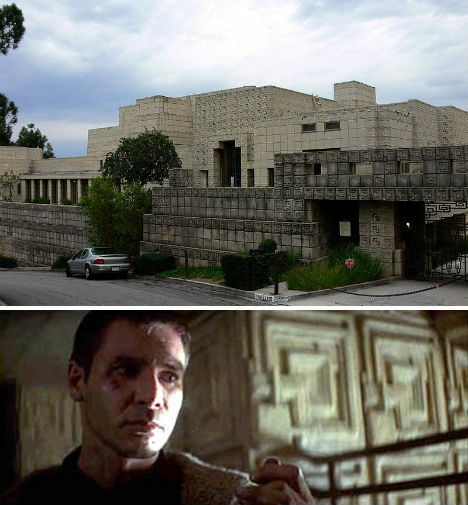 Among the most iconic and instantly recognizable real-life film settings, the Ennis House and its prominent architectural detail has been featured in over a dozen movies, a television show, commercials, fashion shoots and music videos. Although its exterior only appeared briefly in a single on-location shot in ‘Bladerunner’, it’s best remembered for that film (the interior shots were recreated on a sound stage). Other films like’ Rush Hour’ and ‘The Thirteenth Floor’ filmed scenes in its cathedral-like interior. The blocky Mayan Revival-style tiles are so iconic, they were cast and recreated for a scene in ‘Mulholland Drive’. 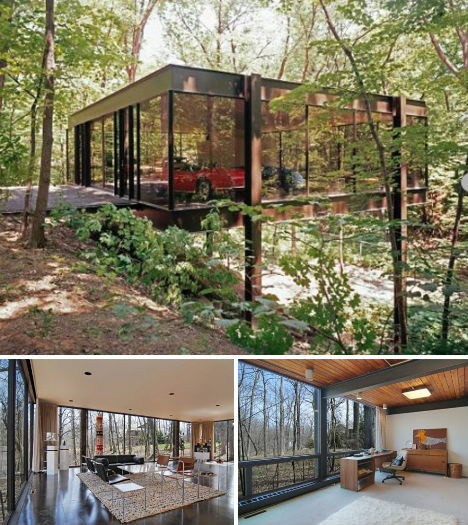 Put on the market in 2010 and swiftly sold, the Sculptured House, an unusually shaped mid-1960s home, served as a major setting in the Woody Allen movie ‘Sleeper’. Located just outside of Denver, the home – referred to by locals as the mushroom house or the clamshell house – was designed by architect Charles Deaton. The new owners gave it an energy-efficient makeover and have reportedly offered it up to HGTV as the setting for a reality show. 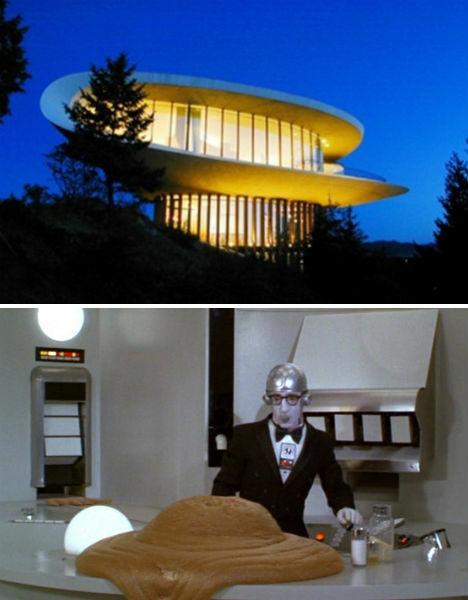 The bold modern home that serves as Bond villain Ernst Stavro Blofeld’s lair in ‘Diamonds are Forever’ practically steals the show with its massive concrete domed roof looming over an indoor-outdoor swimming pool. 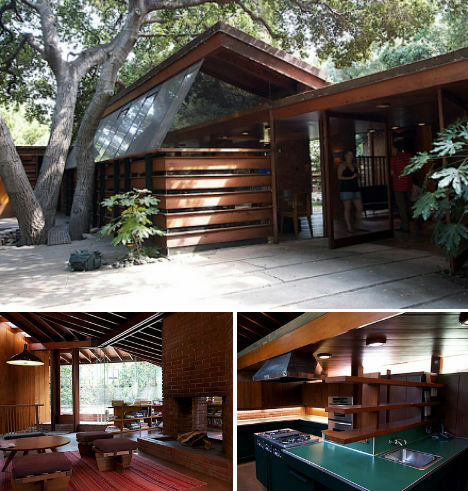 The Elrod House was also designed by John Lautner, an apprentice of Frank Lloyd Wright who crafted an iconoclastic and sometimes controversial style that interacts strongly with the buildings’ natural environments. 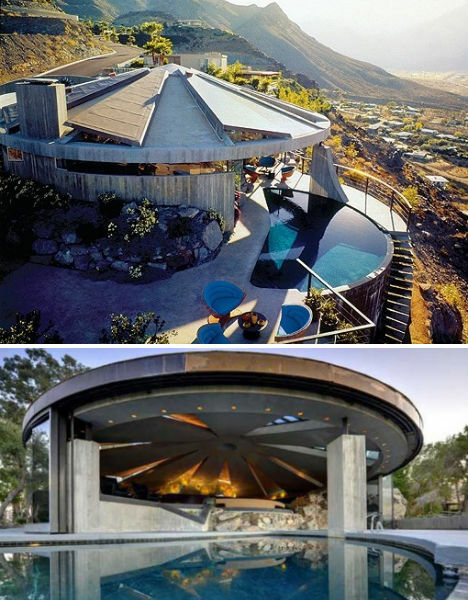 Designed to shield the Palm Springs home from the harsh desert sun, the concrete dome echoes massive boulders that were uncovered on the hillside during construction. Considered an important structure in modern architectural history, the Lovell House was the first steel frame home in the United States and an early example of the use of gunite (sprayed-on concrete). 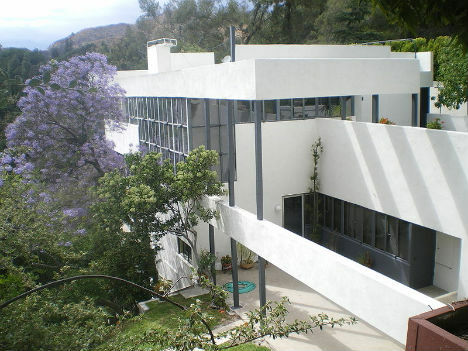 It was designed and built by Richard Neutra in the International Style in 1927 and is located in Los Angeles. It appeared as the home of Pierce Morehouse Patchett in the 1997 film ‘L.A. Confidential’. This home not only stands out as one of the largest floating homes on Seattle’s Lake Union, but for playing a role in the sappy 1993 Tom Hanks and Meg Ryan movie, ‘Sleepless in Seattle’. 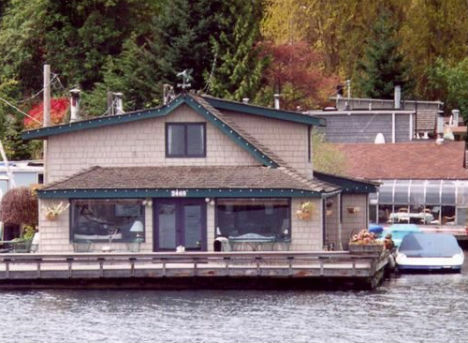 The 4-bedroom houseboat, built in 1978, is not open to the public but can be spotted by fans of the film from either land or sea (by hitching a ride on the Duck Tour). 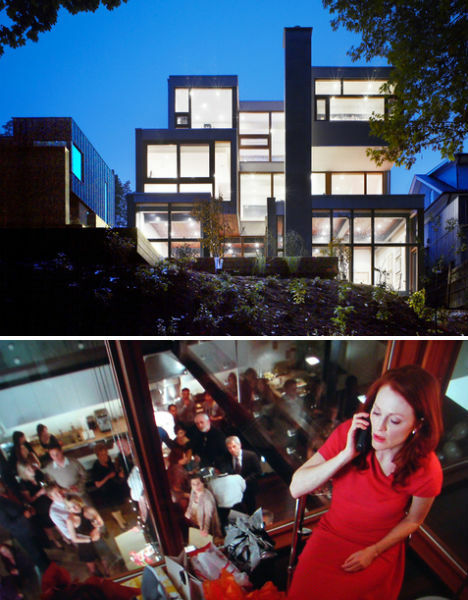 The 2010 movie ‘Chloe’ wasn’t exactly a stunner, but one of its main settings certainly was: a geometric steel-and-glass home in Toronto by architect Drew Mandel. 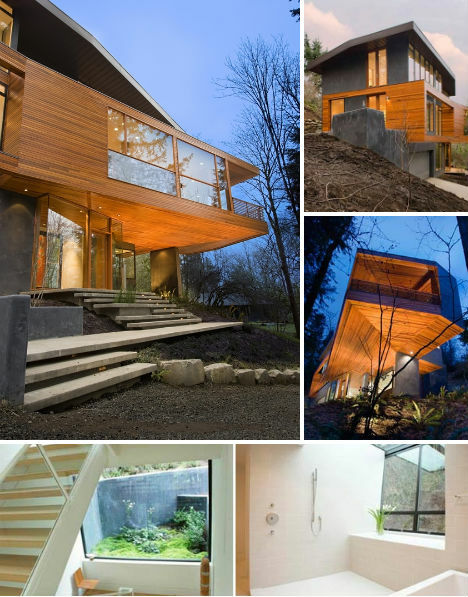 The Ravine House was chosen for its dramatic location and its glassy interiors, which make for interesting filming angles, especially from upstairs. But those who have seen the movie won’t even recognize the outside of the house, which, despite its beauty, was not featured in the film. The owners wanted to retain some semblance of privacy, so the facade of another house down the street was used for exterior shots. Incidentally the third Julianne Moore film on this list, ‘A Single Man’ was all eye candy. Helmed by first-time director and famed fashion designer Tom Ford, the Oscar-winning vehicle for leading man Colin Firth was shot partially in a 1949 John Lautner home. The Schaffer Residence is dark and moody, located on a heavily wooded plot in the bottom of a valley in Glendale, California. The real-life home in which Uma Thurman’s character Mia Wallace lives in the movie ‘Pulp Fiction’ is located – where else? – in Beverly Hills, just a few miles north of Sunset Boulevard. While curious passersby won’t see much more than a geometric gate, the magic of modern real estate listings give us a glimpse of the interiors, which we’ll forever associate with the song ‘Girl, You’ll be a Woman Soon.’ The three-bedroom home, which was built in the ’60s, sold in 2010 for an undisclosed sum, though the listing didn’t even mention its prominent role in one of the biggest movies of the 1990s. The 2006 movie ‘The Lake House’ might have been a critical flop, but there’s one element of it that still stands out: the house itself. Ostensibly located in the Chicago area, the modern house, a glass box on stilts at the end of a pier, is minimalist steel in the tradition of architect Mies van der Rohe. 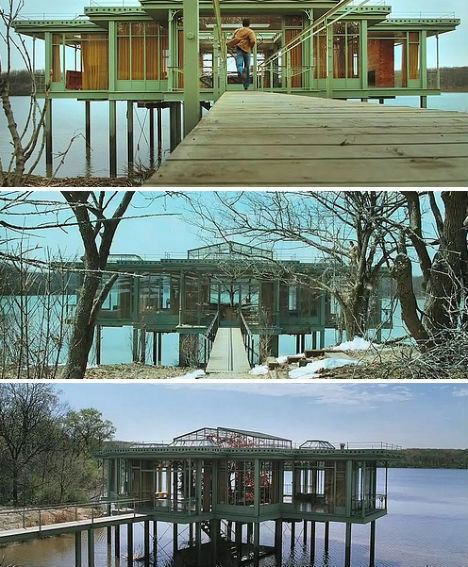 Sadly, the house – which was constructed especially for the movie – was dismantled when filming was complete; local laws don’t allow dwellings on this undeveloped portion of the lake. 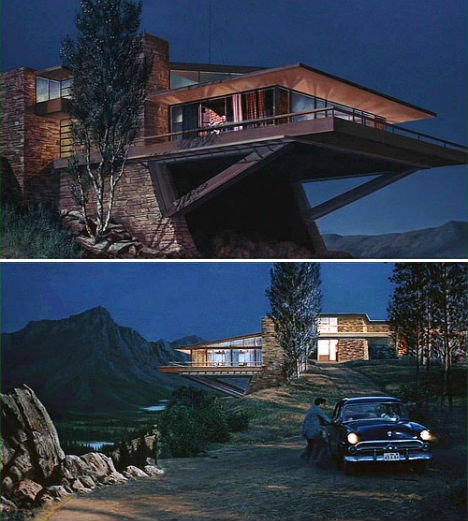 Few modern homes from films are so beloved by architecture geeks as the Vandamm House, which was practically a main character in Alfred Hitchcock’s unforgettable ‘North by Northwest’. And so it is often with bitter disappointment that Hitchcock fans learn that the Vandamm House is not a creation of Frank Lloyd Wright – or even a real house at all. It was an elaborate MGM film set, placed on top of Mount Rushmore using movie magic, but it was indeed designed to resemble the works of Wright, who was the most popular architect when the film was shot in 1958. Hitchcock wanted the home (naturally belonging to a villain) to be not just impossibly luxurious but also familiar, a requirement that couldn’t be met by any real-life location.